Patch Walker will share the Bulldogs captaincy with half-back partner Dominic Brambani for the 2018 season. Picture: Paul Butterfield. Batley Bulldogs head into their opening game of the Betfred Championship season in buoyant mood having won all four games of pre-season. Batley ended their preparations for the new campaign with a 36-34 victory at Doncaster last Sunday, which followed on from wins over Dewsbury Rams, Wakefield Trinity and Keighley Cougars. Batley won all three meetings between the sides last season but coach Matt Diskin knows the Hornets will be a dangerous prospect at home in the opening fixture. Diskin said: “I am happy with how it has gone. We have built some momentum, but you can’t look too deeply into pre-season. “Everybody is fine-tuning and the bigger picture is developing the things you’ve been working on in training – but we all want to win. Batley ran in seven tries at the Doncaster Sports Village with winger Shaun Ainscough and in-form back row man Dane Manning bagging a brace apiece. Adam Gledhill, Tom Hemingway and Michael Ward were the other Batley try scorers and Doncaster only fought themselves back in the game after Diskin experimented with some positional changes in the second half. Diskin was satisfied with the performance, adding: “It was all right, not bad at all. “We looked dangerous with the ball, though we still need to be a bit more clinical regarding some of our end skill. “But when everybody was in the right positions we were quite clinical with the ball. Batley have also confirmed that half-back partners Dominic Brambani and Patch Walker will be joint captains this season. 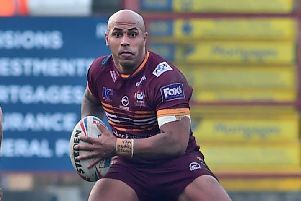 Walker has been an influential figure since joining Batley from Sheffield Eagles in 2016 and he has made 52 appearances for the Bulldogs, scoring 358 points from five tries, 168 goals and two drop goals. Brambani also joined Batley from Sheffield in 2016 and has played 62 games, scoring 162 points, during his time at Mount Pleasant.